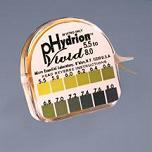 Dip and Read pH Test Paper is the most commonly requested pH Paper for pH testing of saliva and urine. This pH paper has a range from 5.5-8.0 in .2 increments it has distinct, easy to read colour matches around the critical pH level of 7.00 (neutral pH) The single roll dispenser contains 4.7 metres of testing tape providing over 150 separate tests using 3cm strips. Plasma pH Drops are a unique combination of the most alkaline minerals and compounds. This product is one of a kind due to its strength and effectiveness. Can be used to alkalise tea, coffee or alcohol. 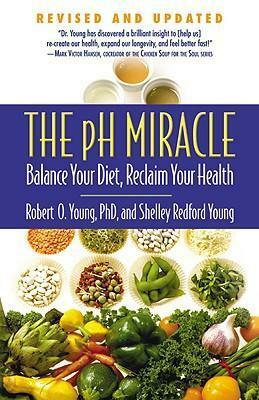 Using Plasma pH is one of the best ways to make your water alkaline while helping you to get rid of acid and regain vital health. Dr. Young has developed an all organic product formulated to support a healthy Alkaline lifestyle and provide your body with the organic nutrients it needs to combat aging, help with weight loss or weight gain, and provide long-lasting energy. L-Arginine Max by pH Miracle is a 100% vegan amino complex featuring L-Arginine for healthy circulation and muscle metabolism, Magnesium Chloride for several body processes such as strengthening bones, Co-Q10 for energy production in every cell, B vitamins for mental and cardiovascular benefits, and vegan-sourced vitamin D3 for overall health. Because the gastrointestinal system can too easily become overrun with positively charged acids, cleansing and alkalizing becomes necessary. Magnesium Oxide and Sodium Carbonate are negatively charged and very alkaline. Thus, they can help soak up harmful acids found throughout the digestive system. Our Omega 3-6-9 organic essential oil blend is a unique blend of organic flax, borage, and hemp oil containing the ideal ratio (2:1:1) of omega 3, 6, and 9 essential oils. *New Improved Formula is better absorbed. 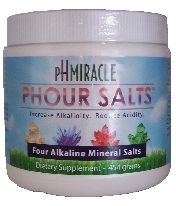 Young pHorever pHour Salts 454gm The 'ultimate' baking soda: A combination of four powerful salts (sodium bicarbonate, potassium bicarbonate, magnesium chloride and calcium chloride) Urine ph levels can become more alkaline within 15-30 minutes after taking this product.